BARIATRIC Socks (Extremely Large). 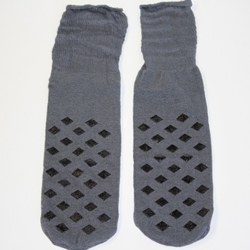 These are Bari-Tred BRAND non-skid slipper socks. They will fit a XXXX-Large size foot. Great for swelling around the ankles or legs. Please note this sock is hospital grade and it is not designed for extended use. 18.5" long, 4.75 "wide. Stretches much larger.